For anyone who has read any of my other posts, you’ve probably noticed that I haven’t shared the names of my family members. This is a pretty new venture for me, and while they are being supportive enough, I’m not at a point at which I want to go any further in invading their privacy. I ran through way too many pseudonym possibilities in my head, because I get fixated on this sort of thing. I could have used initials, or middle names, or the names of fictional characters. I kept trying to come up with things in sets of threes. The Three Stooges immediately came to mind, since I have three boys, and their behavior often makes me feel like I’m in one of those movies. But I don’t actually care for the Stooges, and it’s my blog. The Three Musketeers’ names sound a bit too formal. And my favorite naming of threes – “”Hi, I’m Larry; this is my brother Darryl, and this is my other brother Darryl” – would just be confusing 🙂 I didn’t want the kids deciding to check this out later and getting all bothered by anything after the fact, so I ran some ideas by them, and they have agreed (with varying degrees of enthusiasm/reluctance – that they will live with occasionally being referred to as Simon, Alvin, and Theodore. 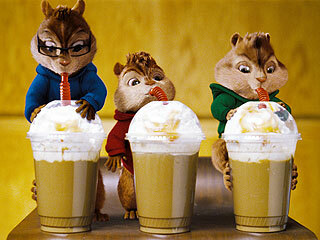 Here’s a wiki description of the originals: “Alvin, the mischievous troublemaker, who quickly became the star of the group; Simon, the tall intellectual; and Theodore, the chubby, impressionable one.” So my kids don’t entirely match up – even aside from not actually being animated rodents. But my Simon is tall and very brainy (he’s also my guy on the spectrum); my Alvin is the guy who goes around stirring up trouble, is musical and likes to perform; and my Theodore still has those chubby little boy cheeks and likes to ask questions and follow in the footsteps of his big brothers. Anyway, for now it works for me. I can’t really call my husband Dave, in keeping with the theme, because I have a sibling by that name, and it would just be weird. So until I come up with something acceptable, he can just be Hubby. It’s not that interesting, but I think he’ll prefer that to Captain Tightwad, which is the only other name that keeps popping into my head with any regularity 🙂 That’s not very nice, is it? Still, it’s my blog.